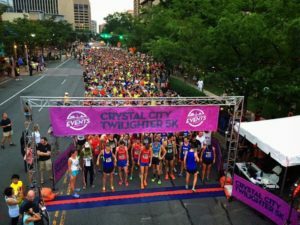 Crystal City will host the annual Crystal City Twilighter 5K race on Saturday, July 23. The race, organized by Pacers, will kick off at 8:30 p.m. The relatively flat course will start and finish will be in front of 2121 Crystal Drive. There will also be a post-race party with food and drink specials at local restaurants. Cash prizes will be awarded to overall male and female runners. Age groups ranging from 1-10 and 80+ will also be given prizes. Registration is $45 for adults over the age of 18, but $25 for those 18 and younger. Space is limited to 3,000 runners. Disclosure: The run is sponsored by the Crystal City BID, an ARLnow.com advertiser.